Fontina, Parmesan, and Cheddar Cheese combined with Campbell's Mac & Cheese topped with panko and baked until golden brown. 2. Preheat oven to 375°F. Spray oven-proof casserole dish with vegetable cooking spray. Reserve. 3. 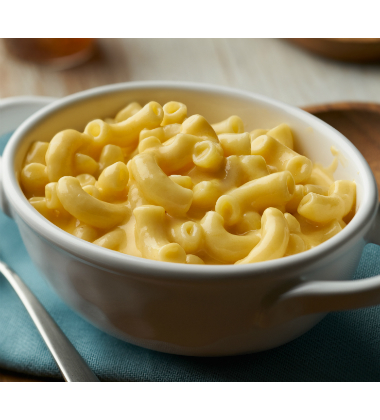 In large bowl, mix together thawed macaroni, half (3/4 cup) of parmesan cheese, and all of the fontina and cheddar cheese. Place in greased oven-proof casserole dish. Reserve. panko	 2 oz. 12 tbsp. butter, melted	 1 oz. 2 tbsp. 1. In medium bowl, mix together remaining (3/4 cup) parmesan cheese, panko and melted butter. Sprinkle mixture evenly over top of filled casserole dish. panko	 2.25 oz. 12 tbsp. butter	 1 oz. 2 tbsp.